Now then, on to the important stuff. Me. I was born in Alaska. 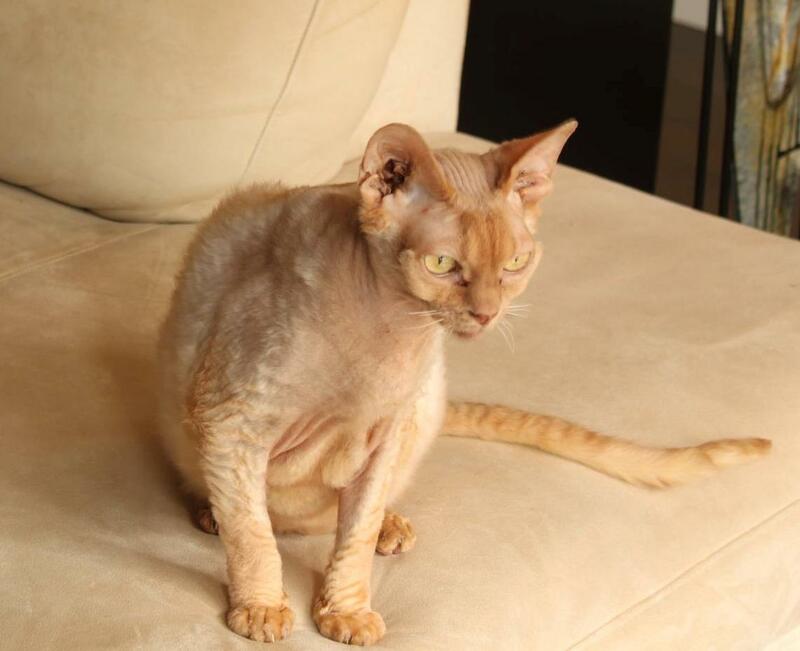 I am a highborn lad whose pedigree is known as Devonrex. Mew! My first home was with Julien and Pat Leger. My brother and I went to live with them along with another cat whose name is not important. These two humans then had the audacity to have a litter of their own! I felt I was being swallowed by this vortex where I meant nothing. I tried to remind them daily that I was the supreme being, but did they listen? They were simply impossible to train. After a year and a half and many discussions they agreed to let me choose some other humans. I recall hearing them tell my new humans that I was at times ‘demanding and needy.’ They never did understand me. Mew! I have been with my new humans for close to six years now. The younger human is my primary care giver, the older one I like to sleep on. They confound me though. Just when I think I’ve got them trained to my satisfaction, they change things and they have the most annoying habits! I spend a good 45 minutes of everyday trying to tame them. It is exhausting work, I can assure you, that requires at least 18 hours of sleep each day. Now for the last few weeks they have been home where I like them. Suddenly they are gone all day once again and every few days I’ll have them at home again. If they’ve been gone all day then I demand the moment they come home that they love me and show me the respect I deserve. Now I now that some cats would see this as a sign of desperation, but humans need to be reminded of what’s important. Me. I run about the place making sure that I am in their line of vision and am very vocal. And I do this for a good five minutes or so. Exhausting but crucial work. I am back and feel very refreshed. Now where was I? Oh yes, I was about to share my dilemma regarding my humans. They are okay…still there is room for improvement. We will be curled up on the sofa. I’ll be nice and comfy and settled in for a good long nap when the damn humans will push me off! They tell me I’m too hot or that they are not comfortable. Seriously? What about me? Every now and again I give them a little nip on the arm. I never draw blood. This is simply to remind them who the boss is around here. They are always aghast at this. I don’t do this often. If anything it just supreme frustration that causes me to react this way. After all the time and effort I put into training them and at times it just seems so futile. They make foolish comments to me. The older human tells me I meow like a ‘girly man.’ I have no idea what she means by this. I can assure you, I am all male…or at least I was. Mew! I will finish with a brief explanation of what we cats require. Cats are the supreme beings on this planet. Some more so, such as myself. That is the first thing you must understand. Everything in this world is designed to make us happy. It is my understanding that there is a cat on this internet thingy called Stockington and he has apparently quite the following. Mew to him! No…make that a double mew! I haven’t read his posts…hmmm, I’ll have to wrap this up. My human is regaining consciousness. But I will check out his site. Perhaps this internet thing will be a way for cats to unite and share ideas on our final quest of having humans recognize our glory and bow to us. There should be temples raised in my name alone, I am that fabulous. Next time I will do a bit of homework on other cat sites and see if we…meowwww! Oh, I am so tired. I must go now and rest. You should just be able to look into a cat’s eyes and see what it is we want. Really it is just that simple. This thinking and communication is very taxing on us. Ah, what we do for our humans? Till later then.